Originally scheduled to ship in October, the InkCase Plus E-ink smartphone case has hit a minor production snafu but will be shipping later this month. Sorry for keep you waiting. For those who just want the InkCase+ and Pouch, we should arrange the courier to you by 20 November. And for those with FitCase, we will also target to ship out to you within first half of December. 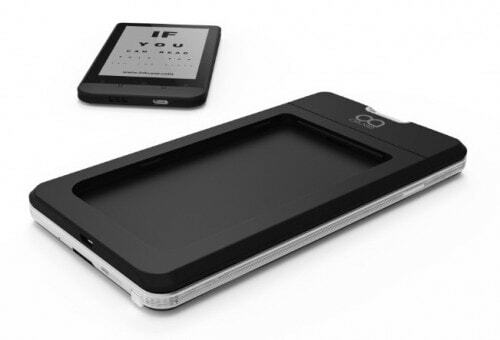 The InkCase Plus has two components. The first is a module with a 3.5" E-ink screen, battery, and Bluetooth, and the other component is the FitCase, which the screen module snaps into. You can click on the photo above to see a gif which shows the two parts snapping together. Gajah is committed to making 10 different FitCases for 8 different smartphone models, including 4 Samsung models (more details here). They also plan to make a couple one-size-fits-most cases (the smaller model will be sized to fit smartphones with screens between 4.3" and 5.2", while the larger unit is intended to work with screens between 5.3" and 6"). With luck those cases will ship in mid-December. Since I got one with a pouch, my order should ship later this month. I backed the campaign because I fully expected that it would ship on schedule. It looks like I missed that bet, but not by much. I was lucky enough to get my hands on an early sample of the InkCase Plus back in July. I didn't get a case with it, but that didn't get in the way of pairing the Plus with a tablet and putting it through its paces. It was intended to work as a secondary screen, and it required an app running on your Android device to send over each screenful of data (I'm told this will change in in the production unit, which will be able to work as a standalone ereader). Thanks to the very sharp (360 x 600) screen even small fonts were quite readable, and I also noted that the companion app and the Sports app also worked smoothly. Have the Major Publishers Decided They Can’t Match the Success of an Indie Blockbuster? Is Losing a Single Editor a “Setback” Amazon Publishing?